With 12 minutes remaining in the second half, Liberty guard Keenan Gumbs took the ball on the left wing and drove to the hoop for a dunk, sending the home crowd into a frenzy. 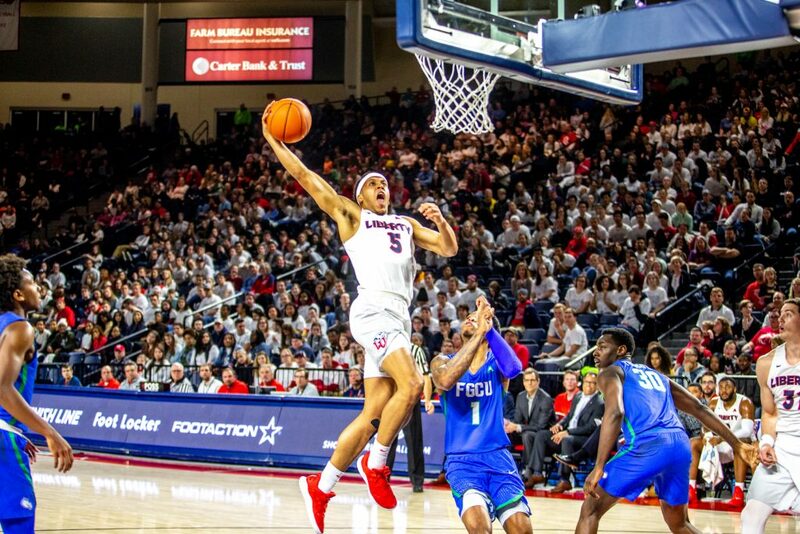 The bucket gave Liberty a nine-point advantage and all the confidence they would need to grind out a 74-67 victory over perennial Atlantic Sun powerhouse Florida Gulf Coast Saturday, Feb. 9, in the Vines Center. 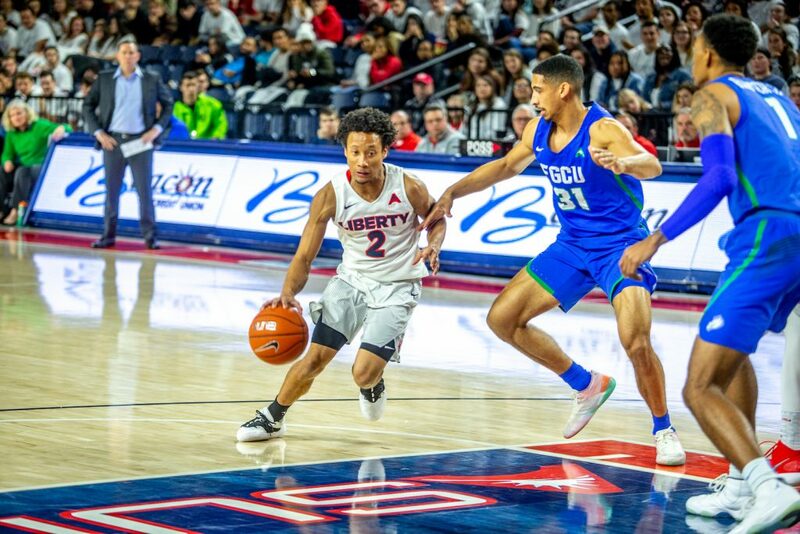 Liberty’s win over the Eagles marked the first time in three seasons that an ASUN opponent swept the season series with FGCU. The Flames beat FGCU 81-63 to open ASUN play, Jan. 5 in Fort Myers. SMASH — Senior Keenan Gumbs ignited the crowd with a dunk. The Flames got the victory thanks to a solid performance from their bench. Along with Gumbs, who finished with 6 points on 3-of-3 shooting from the field, freshman Darius McGhee provided a spark as soon as he stepped onto the floor. McGhee, who was one of the more prolific scorers early in the season for the Flames, has struggled shooting in recent games, but he came out firing Saturday. Just seconds after checking in during the first half, McGhee drove to the hoop, made a layup and was fouled. The 5-foot-9-inch guard added two 3-pointers in the first half, including a running shot to beat the buzzer at the end of the half. Another Flame who broke out against Florida Gulf Coast after recent struggles was redshirt junior Scottie James. James has been slowed down and frustrated in ASUN play, but the star forward battled for 10 points and 14 rebounds against the Eagles. For FGCU, it was senior Schadrac Casimir who scored early an often, totaling 33 points in the game. Casimir was hitting shots all night, finishing 5-8 from 3 and 8-14 overall from the floor. “Casimir was throwing in things from everywhere,” McKay said. The Flames struggled all night to slow down Casimir, and they found themselves scrambling in the second half when their two best defenders Elijah Cuffee and Lovell Cabbil both fouled out of the game. The Flames needed every bit of their depth in order to hold off the Eagles. SMALL BUT MIGHTY — Freshman Darius McGhee does not allow his size to hinder his playing ability. “I think we won the way we are going to win most nights (and) that’s as a team, with everybody contributing,” McKay said. With the victory, Liberty moves to 10-1 in the ASUN and 21-5 overall on the season. The Flames now turn their focus to a showdown with conference rival Lipscomb. Liberty will look to avenge their 79-59 pounding they took against the Bisons back on Jan. 29 in the Vines Center. Lipscomb is currently 11-0 in the ASUN and have not won a game by less than eight points so far in conference play. The Flames will look to use the momentum of a hard-fought victory over FGCU to propel them into their matchup with Lipscomb Feb. 13 and the remainder of their season. The Flames will return to the Vines Center Tuesday, Feb. 26 when they host Kennesaw State and celebrate senior night.